Don’t worry that you’ve seen every reality show about cake on TV. Prepare for a show that is nothing like Cake Wars, Cupcake Wars, Cake Boss, Ace of Cakes, Last Cake Standing, Ultimate Cake Off, or DC Cupcakes. Bravo has announced that it is coming out with a new series about apology cakes! "See what’s cooking in the world of apology cakes, where people say sorry by whipping-up a baked creation… which doesn’t always go according to plan." If you’re wondering what an apology cake is, it’s exactly what it sounds like. 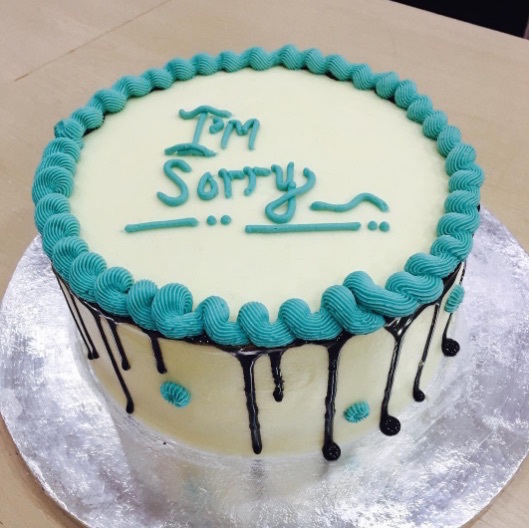 A cake with a frosting apology on it. Apparently, apology cakes are a huge thing. They range from being funny to being incredibly specific. Basically, they can be about whatever you want. Sorry you missed a friend’s birthday? Bake them an apology cake. Sorry you used the last bit of conditioner? Apology cake. It seems like the series will dive into what happens after the apology cake is given. Could someone be so unforgiving they smash the cake into their apologizer’s face? Will there be apology cupcakes? We’re just going to have to tune in. In the meantime, if anyone wants to whip us up a chocolate apology cake with vanilla frosting…we’re very forgiving.